I have a terrible condition where my eyes glaze over as soon as I'm in an audience in a dark room with a projector turned on. 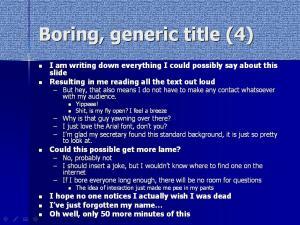 We've all been subjected to boring presentations; whether in a conference room at work or by a professor in a classroom. As soon as you read straight from a PowerPoint slide, the audience tunes you out. At the iTen Wired Summit, David Powell from TekLinks gave a great overview of how consumers are driving mobile technologies to the cloud and beyond. Some of the content was a rehash but was so well presented in a hair band theme that made the presentation memorable and entertaining. What a concept: enjoying and remembering ideas in a corporate setting. On the flip-side, there was a presentation given at a conference on Big Data this past summer. I had high hopes. The audience was full of people who are dealing with massive amounts of data and weren't sure how to handle it. Rather than talking about the challenges and some recommendations, the presenters spent 45 minutes flipping through slides and speaking as fast as possible. 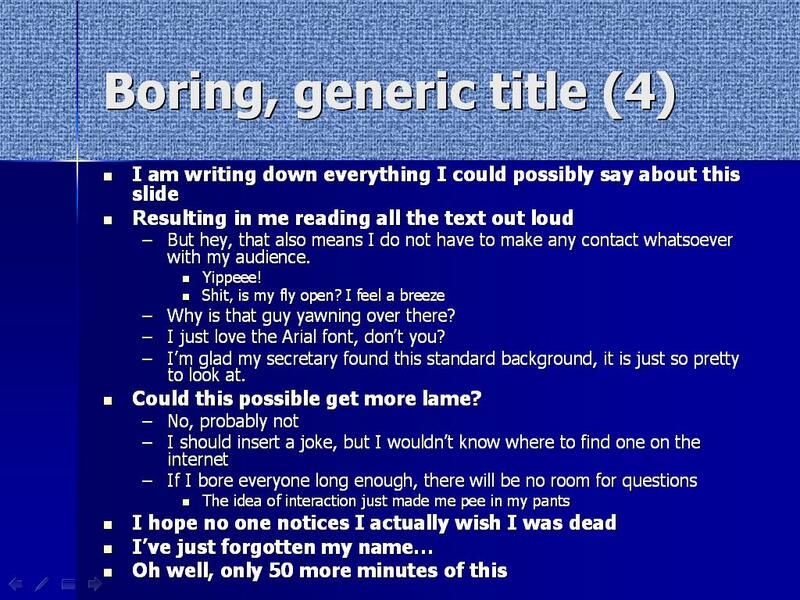 Some slides had 100+ words on them and were impossible to follow. Rather than telling the story of Big Data, they just explained facts faster than the audience could comprehend. We all left more confused than when the presentations started. Keep it simple. Presentations can contain very complex items, but the more information you show on a slide, the less information your audience will retain. Tell stories. Viewers of your presentation are more likely to remember a story and the ideas presented in the story that just straight facts. (Check out this quick video on story telling in presentations). Give the audience something to remember your presentation. This can include a theme to your slides or a simple key phrase you repeat several times. Provide more than just bullet points with lists of information (including large pictures, audio clips, and/or video clips). Avoid using cheesy clip art as this takes away from the professionalism. For a quality example, check out: http://www.slideshare.net/jmtcz. You can also check out Garr Reynolds' book Presentation Zen for ideas on how to improve your presentation delivery. Take that extra 30 minutes to improve the presentation and people will enjoy your talks rather than dread them.